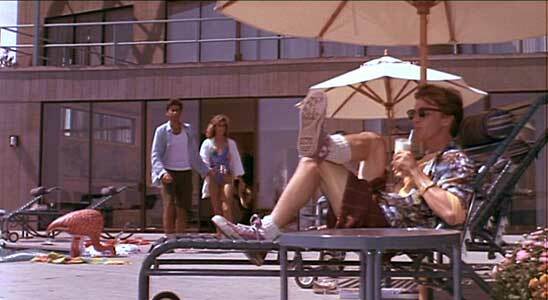 Andrew McCarthy wears purple high top Converse “Chuck Taylor” All Stars in the film. Larry and Richard discover a scheme to defraud the insurance company. 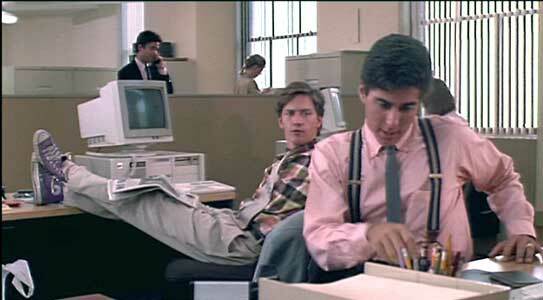 Larry Wilson (Andrew McCarthy) and Richard Parker (Jonathan Silverman) are two young computer data processors working for a large insurance company in New York City. The two friends are a typical film “odd couple”, with Richard cast as the consciencious workaholic while the free-spirited Larry is always looking for an excuse to have fun. The two have been given the assignment to reprogram the company’s data, and while going through the company’s records they stumble on a scam that has been diverting millions of dollars from the company. Excited about their find, and sure that it will get them promotions and raises, Larry and Richard make an appointment with their boss Bernie Lomax (Terry Kiser) to show him their discovery. Bernie, a high roller with flashy and expensive tastes, acts very pleased with their work. As a reward he invites them to his house on Hampton Island for the upcoming Labor Day weekend to go over their figures. Actually, it’s Bernie who’s been embezzling the money and the invitation is only the first move in his quickly improvised plan to get rid of Larry and Richard and blame the scam on them. Larry watches the party crowd go by Bernie’s house on Hampton Island. And so Larry and Richard go stumbling off to the Hamptons excited about their chance to mingle with Bernie’s jet set crowd. They soon find out that everybody on the island knows Bernie, who has a reputation as the life of the party, a generous host, and everybody’s friend. But when they arrive they are shocked to find their host dead of what they believe to be a drug overdose. In truth, Bernie was killed because when he told his mob conspirators about the discovery of their scam, they decided to hit Bernie instead of the two boys, partly to silence Bernie but also because he was having an affair with the chief mobster’s girlfriend. Frightened, Richard wants to immediately call the police to report Bernie’s death, but Larry says “let’s wait and see.” This is because he doesn’t know what to tell the police and having seen a taste of the good life doesn’t want to spoil the good time they are just starting to experience. Since they both thought that Bernie was alive when they first got there, why not continue the illusion through the weekend? This thought is immediately confirmed after a floating party comes through Bernie’s house and no one seems to notice that Bernie is dead. From here on we get a series of comic situations where Larry and Richard conspire to maintain the illusion, often dragging around Bernie’s corpse from one place to another. The two are so successful that the mob hitman ends up coming back to make sure that Bernie really is dead, and Larry and Richard end up runnning all over the island because they think that the killer is after them. 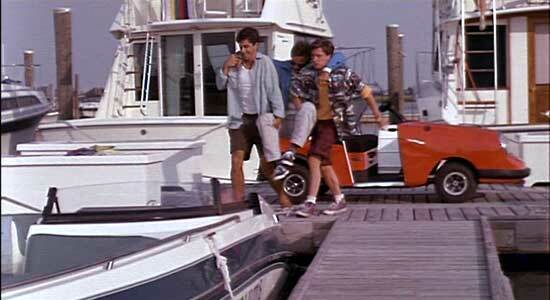 Richard and Larry place Bernie in his boat. 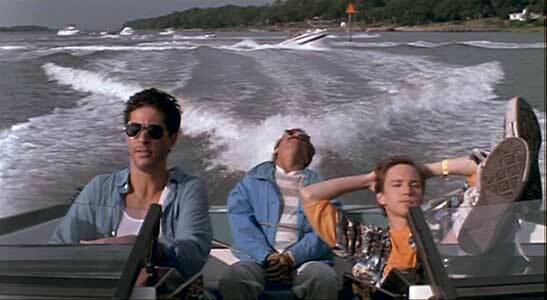 Weekend At Bernie’s is basically a modern vaudeville routine that has been stretched out to make a full length film. The film ends up being entertaining primarily due to the interplay between McCarthy and Silverman. Although the subject matter is macabre when you think about it, the film’s relatively fast pace and the continuous on-screen antics of McCarthy keep you interested enought to ignore the flaws of the story. Andrew McCarthy and Jonathan Silverman put a lot of energy into their roles and their unabashed enthusiasm carries you through the low brow humor and cliches of the screenplay. Catherine Mary Stewart has a small role as Richard’s girl friend Gwen Saunders, and his often inept attempts to woo her form a humorous subplot to the story. Catherine Parks is given very brief screen time in the role of Tina, the moll who is two-timing the mob boss with Bernie, but her final scene where she visits the now dead Bernie is one of the best bits of the film. Director Ted Kotcheff keeps this farce moving and enjoyable if you can accept its dark humor and stereotyped characters. Richard and Larry escape with Bernie in his boat. Larry and Richard hide from Bernie’s killer. 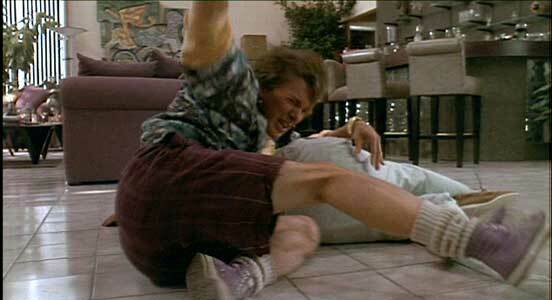 Andrew McCarthy in his role as Larry wears light purple high top chucks throughout the film. He is seen wearing them with business clothes in the office as well as with shorts and Hawaiian shirts when they go to Bernie’s house on Hampton Island, so they seem to be an integral part of his character. Cinematographer François Protat gives us many good chucks shots throughout the film. The best action scene is during the fight with the mob hitman who actually killed Bernie, but comes back to Bernie’s place because everybody else acts like Bernie is still alive. Larry gets entangled with Bernie’s body. Weekend at Bernie’s. (1989) Andrew McCarthy, Jonathan Silverman, Catherine May Stewart, Terry Kisar. Directed by Ted Kotcheff. Category: Comedy.